John Horace Panizza was born on 23 March 1931 at Southern Cross, Western Australia, the eldest child of Bortolo (Robert) Panizza, a farmer, and his wife Caterina Cristina, née Della Bona. Born in Italy, Panizza's parents came to Australia in 1921. Robert Panizza initially cut sugar cane in Ingham, Queensland, from where he went on to work in the mines near Broken Hill and Mt Isa. The Panizzas then moved across to the Kalgoorlie region of Western Australia, where Robert and his two brothers purchased land which became the family farm, near the goldmining town of Marvel Loch, thirty-two kilometres south-east of Southern Cross. John Panizza's first language was Italian. He could not speak English fluently until the age of nine. He studied at Aquinas College in Perth, a Catholic school run by the Christian Brothers. Even though he managed to finish his secondary education as one of the top twenty students in Western Australia he did not seek a tertiary education. He worked on the family farm, and, as the eldest son, ultimately managed it with the help of his two brothers, Robert (Bob) and Horace. The farming operation was added to over the years, producing wool and beef as well as becoming one of the ten biggest wheat producers in the country. John Panizza also established business interests in land development and real estate. On 8 February 1958 he married Coral Anne Noble with whom he had four children. Panizza's interest in the Senate was sparked at school by study of the Roman Senate, and in 1951 by the double dissolution election of the federal Parliament, which, he said, showed him that the ultimate power of federal Parliament lay in the Senate. He had an ambition to enter politics from his early twenties but believed that before he could work on behalf of other people he needed to show that he could manage his own affairs. A staunch Catholic, Panizza was well known and liked in the Southern Cross area and very committed to the local community. Elected to the Yilgarn Shire Council in 1975, he served as Shire President from 1982 to 1987. The hallmark of his term in local government was his commitment to community service projects including the provision of better sporting infrastructure to the region. He was a member of the Junior Farmers' Movement, and became involved in agricultural industry affairs, including as a member of the Western Australian Farmers' Federation. Panizza was initially a member of the National Party but, in 1985, after he lost a preselection contest for the Western Australian Legislative Council, he accepted an invitation to run as a Liberal Party candidate for the half-Legislative Council election in 1986, and so joined the Liberal Party. At the election on 8 February 1986 Panizza came within 115 votes of defeating the sitting member, Mick Gayfer of the National Party, who had held the seat for 24 years. Panizza then nominated and finished third in the Liberal Party preselection process for the half-Senate election scheduled for late 1987. However, due to the simulaneous dissolution of the Houses of Parliament on 5 June 1987, precipitating a full Senate election, he was given the fifth spot on the Liberal Party ticket, behind four sitting senators, and was the tenth candidate elected. In March 1990 Panizza was placed second on the Liberal Party ticket and was re-elected. He was also successful at the election of March 1996. Panizza was a frequent speaker in the Senate; party colleagues awarded him prizes for the senator who spoke the most in the chamber and made the most recorded interjections in Hansard. 'A true believer in federalism', Panizza took every opportunity to raise issues that directly affected Western Australia, and was proud to be an advocate for the particular region in which he lived, where major industries to an extent coincided with his personal interests. 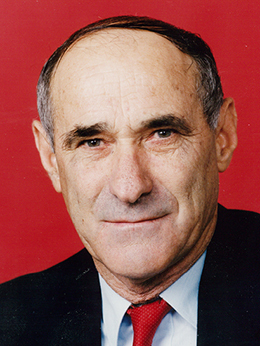 In his first speech in the Senate on 21 October 1987, Panizza addressed what he believed to be the main issues affecting Western Australian regions. Stressing the importance of Western Australian rural industries to the Australian economy, he highlighted issues affecting primary producers such as international wheat, meat and wool prices, import duties on fuel and farm chemicals, inefficiencies in transport and on the waterfront, the demise of income equalisation deposits, and the need for government assistance in the development of Western Australia's fishing industry. He outlined difficulties in the state's mining industries, including falling prices and rising costs, and said: 'Future growth in mineral revenue lies in processing from the raw state to give added value, and this requires new investment'. Exploration for new mineral deposits, essential for the expansion of the industry, he said, should not be prevented by restricting access to land in response to 'the demands of a very small, vocal section of the conservation movement'. All of these matters were to occupy Panizza throughout his Senate career. Panizza said that he was 'humble and proud on behalf of all Italian migrants to have achieved the honour of being the first person of Italian parentage to be elected to the Senate'. He indicated that he had suffered discrimination due to his migrant background but he appreciated the opportunities Australia had offered: 'I feel that my family and many others are living proof of what can be achieved in Australia as a result of the opportunities which Australia provided'. He spoke in the Senate on behalf of migrant groups, and often described their contribution to Australia's economy and culture. In November 1990 he brought the attention of the Senate and the government to injustices done to 'Australians of Italian descent' who were interned in Australia during the Second World War, resulting in a motion expressing the regret of the Senate, and a conciliatory statement by Prime Minister Bob Hawke. Referring frequently to his long years of experience as a wheat farmer, and in what he called 'agro-politics', Panizza was an informed speaker in debates on the wheat marketing bills of 1988 and 1989. Panizza supported the government's proposals to deregulate domestic storage, handling and transport of wheat, believing that the end of monopolies would result in the emergence of more efficient and economical practices, particularly in the transport of wheat, as it would allow farmers to transport by road rather than being restricted to rail over certain distances. He claimed to speak for a great majority of farmers when he opposed the further deregulation of domestic wheat marketing, which he thought would have a negative impact on prices; he insisted that Coalition support for the Wheat Marketing Bill 1989 should be conditional on the passage of a raft of amendments, and threatened to cross the floor if this condition was not met. Ultimately he complied with the opinion of the majority of his party colleagues and voted 'though with some pang of conscience' for the bill, virtually unamended. He continued to be vigilant of the wheat market, repeatedly calling on the government to assist in maintaining prices in a depressed market, where international prices suffered from a United States policy of subsidising the price of its wheat exports. Between the years 1990 and 1993 he gave notice of more than twenty motions on this subject, although few of these were debated or passed in the Senate. Acting Shadow Minister for Land Transport in 1992 and 1993, Panizza said that 'transport, especially in the grain industry, is the biggest single item cost'. He complained of Western Australia's poor allocation of federal road spending. He argued that fuel taxes should be totally vested in road infrastructure, and that they should be abolished for rail transport. He often spoke of how taxation impinged on country people, particularly in relation to fuel taxes and excise. As a member of the Select Committee on Agricultural and Veterinary Chemicals in Australia, established in 1988 following the discovery of pesticide in Australian beef sold to the United States, Panizza was concerned to defend the agricultural chemicals industry against a 'witch hunt'. In 1994 proposed cuts to CSIRO funding for rural research, and proposals to close agricultural research stations in Western Australia prompted him to seek an inquiry into the administration and funding of rural research by the CSIRO. His motion for referral of the matter to the Standing Committee on Industry, Science, Technology, Communications and Infrastructure (of which he was a member) passed in the Senate with Democrats and WA Greens support. A consistent advocate for mineral exploration and development, Panizza was opposed to the imposition of company tax on gold miners, and after this measure was introduced with effect from January 1991, he agitated for its removal. Denying the suggestion that his attitude to this tax was based on self-interest, in April 1991 he said: 'I am the only senator or member from Western Australia who actually lives in the goldfields ... it is understandable that I represent the industry, alongside the wheat industry, the wool industry, transport industry and the fishing industry'. ... if that practice becomes at all widespread, it will seriously inhibit the ability of parliamentary committees to have witnesses appear before them. Witnesses simply will not be prepared to come forward if they know that their evidence, which is given honestly in camera—in secret, to be heard only by that committee—is exposed to the public gaze. Senator Olive Zakharov accused the authors of the dissenting report of misrepresenting those who gave the evidence by selective use of actual or alleged comments and referring to comments out of context. On 13 February 1991 the Senate agreed to an order regulating the use of in camera evidence in dissenting reports, allowing dissenting senators to refer to such evidence only to the extent necessary to support the reasoning of the dissent. A private senator's bill introduced by Panizza, the Income Tax Assessment (Isolated Area Zone Extension) Amendment Bill 1992, was passed in the Senate, with support of the Democrats, on 5 November 1992. The bill, which sought to extend isolated area tax rebates to those living on off-shore platforms, was then introduced into the House of Representatives on 9 November 1993. However, it lapsed on the prorogation and subsequent dissolution of the House of Representatives prior to the 1993 general election. After the election Panizza reintroduced his bill, but this time it did not progress. He also twice introduced a Motor Vehicle Standards (Headlights) Amendment Bill, proposing to remove Australian Design Rules requirements that motor cycle headlights be so wired that lights remain on when the cycle is in use, but it did not progress beyond a second reading. Panizza was the subject of some ongoing criticism for his defence of the Christian Brothers in Western Australia in 1989, following the screening of the documentary film Lost Children of the Empire and the release of a book of the same name, dealing with the mistreatment of child migrants under the empire resettlement scheme after the Second World War. Panizza dismissed allegations of child abuse, particularly those directed at Christian Brothers' orphanages in Western Australia, on grounds that the complaints had not been substantiated and they had not appeared for forty years, making it very difficult for the accused to defend themselves. However, in October 1993 when new revelations of abuse arose, he publicly agreed that the matter should be examined by a state-based judicial inquiry, and failing that, by a full parliamentary inquiry. Panizza had strong opinions that occasionally put him at odds with the policy of his party. He considered abstaining from voting on the Human Rights (Sexual Conduct) Bill 1994, which aimed to reduce the age of consent for homosexual acts from twenty-one to eighteen years of age. On 18 October 1994, at a joint party meeting, the then Leader of the Opposition, Alexander Downer, announced that it was Coalition policy 'not to oppose' the bill. When Panizza openly asked Downer whether abstention was acceptable, Downer responded by stating that it was not Coalition practice to allow abstention when 'not opposing' a bill. Panizza, despite his contrary views, decided not to abstain and throughout his career was considered 'a very dependable team player', voting with his party on all issues, when required. Panizza was Deputy Opposition Whip in the Senate from 1993 to 1995, Opposition Whip from 1995 to 1996, and Government Whip from the 1996 election until his death. Senate party colleagues acknowledged that he was 'bossy' and 'undiplomatic' but efficient in his role as Whip. Panizza died in his sleep on 31 January 1997 while in Cairns to attend a hearing of the Committee of Privileges. After his death the ALP agreed to adhere to the customary pairing arrangement with the Coalition Government, ensuring that the then government's tenuous hold on the Senate, when supported by Independent senators Brian Harradine (Tas.) and Mal Colston, was not affected. His casual vacancy was filled, in what were controversial circumstances, by Ross Lightfoot (Lib., WA). John was very much proud to be his own man. No-one bullied John Panizza. He took a stand and stuck to it. He was loyal to his friends. He was loyal to his beliefs. He was loyal to his ideals. He was loyal to his religion. A funeral mass for Panizza was celebrated on 7 February 1997 at St Mary's Cathedral, Perth. CPD, 21 Oct. 1987, pp. 1085–9, 4 Feb. 1997, pp. 1–51; Australian (Syd. ), 8 Feb. 1997, p. 8; SMH, 12 Feb. 1997, p. 35. CPD, 21 Oct. 1987, pp. 1085–9, 23 Aug. 1995. p. 239, 11 Oct. 1988, p. 1158, 5 Nov. 1987, pp. 1761–3, 5 Dec. 1990, p. 4973, 14 Aug. 1991, pp. 339–40. CPD, 17 Dec. 1987, pp. 3380–3, 16 March 1988, pp. 873–4, 1 Dec. 1988, pp. 3290–1, 10 May 1989, p. 2411, 31 May 1989, pp. 3168–70, 2 Dec. 1992, pp. 3989–93, 9 Sept. 1992, pp. 659–61; Media Release, Senator John Panizza, 7 Nov. 1988, 22 Jan. 1991, 20 June 1991, 16 Aug. 1991; CPD, 23 Aug, 1990, pp. 2102–6, 30 May 1994, pp. 833–4, 7 Dec. 1994, pp. 4104–7, 6 June 1994, pp. 1336–40; Media Release, Senator John Panizza, 4 Aug. 1992; CPD, 7 Sept. 1993, pp. 1066–9, 17 Nov. 1993, pp. 3059–63, 9 June 1994, pp. 1637–40, 8 June 1995, pp. 1137–41. CPD, 6 Dec. 1988, pp. 3535–40, 17 April 1991, pp. 2586–7, 18 June 1991, pp. 4857–9; Standing Committee on Environment, Recreation and the Arts, The Potential of the Kakadu National Park Region, Canberra, 1988; AFR (Syd. ), 22 July 1993, p. 18; Kalgoorlie Miner, 1 Jan. 1992, p. 3; Australian (Syd. ), 1 Jan. 1994, p. 12; CPD, 10 Nov. 1988, pp. 2421–33; Harry Evans & Rosemary Laing (eds), Odgers', Australian Senate Practice, 13th ed., Department of the Senate, Canberra, 2012, pp. 505, 538–40. CPD, 5 Nov. 1992, pp. 2400–2. Barry Coldrey, Religious Life Without Integrity: The Sexual Abuse Crisis in the Catholic Church, Tamanaraik Press, Thornbury, Vic., 2001, Ch. 2; Joy Melville & Philip Bean, Lost Children of the Empire, Unwin Hyman, Syd., 1989; CPD, 16 Aug. 1989, pp. 202–5, 29 Aug. 1989, pp. 544–5, 7/8 Sept. 1989, pp. 1292–3, 7 Oct. 1993, pp. 1848–9, 18 Nov. 1993, pp. 3128–30, 4 Feb. 1997, p. 37. Australian (Syd. ), 19 Oct. 1994, p. 2; Sunday Age (Melb. ), 11 Dec. 1994, p. 16; CPD, 4 Feb. 1997, p. 27. WA (Perth), 4 March 1997, p. 26; SMH, 17 March 1997, p. 6; CPD, 4 Feb. 1997, pp. 1–51; Australian (Syd. ), 1 Feb. 1997, p. 4, 4 Feb. 1997, p. 13, 8 Feb. 1997, p. 8; WA (Perth), 8 Feb. 1997, p. 8; SMH, 12 Feb. 1997, p. 11. This biography was first published in The Biographical Dictionary of the Australian Senate, Vol. 4, 1983-2002, Department of the Senate, Canberra, 2017, pp. 547-551.